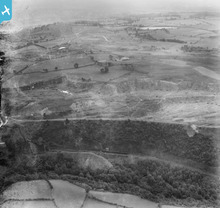 [WPW055417] View of site of Treforest Industrial Estate prior to construction, oblique aerial view. 5"x4" black and white glass plate negative. 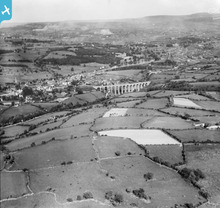 [WPW032572] View of Merthyr Tydfil, showing Cefn Viaduct, oblique aerial view. 5"x4" black and white glass plate negative. 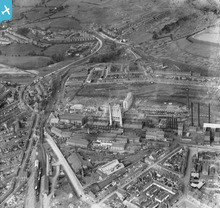 [WPW029863] View of Guest, Keen & Nettlefold, Dowlais Works Merthyr Tydfil, oblique aerial view. 5"x4" black and white glass plate negative. 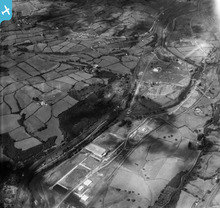 Bottom left of picture is the B&M station at Dowlais Central. Above it lies Ivor Juction. AT the top left of picture you can see the eastern portal of the LNWR Morlais tunnel. 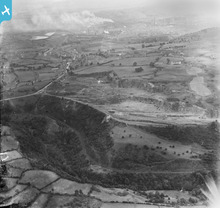 [WPW029877] View of Distant view of Guest, Keen & Nettlefold, Dowlais Works Merthyr Tydfil, oblique aerial view. 5"x4" black and white glass plate negative. Showing the LNWR and B&M Joint Line as in comes out of the Morlais Tunnel into the Taf Fechan Valley. At far left is the line diverges for Ponsticill. Also in shot is the signal box contoling the juction for the B&M line up to Ponsticill.